I'm back! Hopefully for good this time as my creative juices (eww, sounds kinda gross. Sorry!) are back in full flow. I'm so excited to get back into this and share things that I love, think and do with you guys! 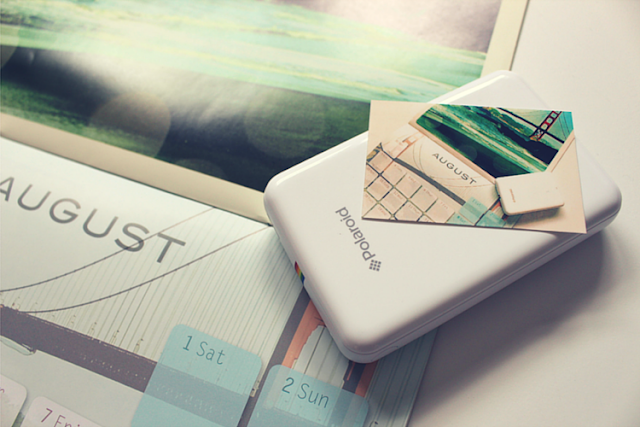 I expect a lot of you will have already heard of the Polaroid Zip Instant Mobile Printer (sold on Amazon here). I can't remember where I first saw it, but I do remember falling in love straight away. As someone who really enjoys taking photos but then never actually displays them anywhere, I thought the whole idea sounded perfect. Take a photo and you can have it stuck on your wall within a few minutes. Immediacy is the lazy man's friend. NO MORE EXCUSES. The Zip is my first foray into the World of Polaroid and I have not been disappointed. The printer looks really smart and has the cute Polaroid rainbow stripes that make it instantly recognisable. Using the Polaroid Zip app (which annoyingly you have to use) you can 'quick print' (print the photo as is), 'edit print' or even use 'Secret view' to add secret messages in the form of codes so that only the intended recipient can read it. Then out comes (slowly, but not too slowly) a perfectly formed miniature of your photography. The quality isn't fantastic up close, but when you're dealing with a 2 by 3 inch photo this isn't such a big deal. The printer works using 'Zink' ('Zero Ink') technology. The scientist in me was intrigued. It basically means that the printer heats up the photo paper which turns the molecules embedded in the special Zink paper different colours depending on the temperature of the plate inside. This is both fascinating and practical, meaning you can carry your Zink printer around without having to worry about ink spillages. I think that's it! I would highly recommend the Polaroid Zip to anyone who loves photography and instant gratification. After the initial purchase it's cheap to run, low maintenance and just fun. Do you have a mobile printer? What do you think?